This post about the “first sphinncon evar” was supposed to be a live one but, unfortunately, there was no wireless connection at the conference in Jerusalem, so I’ll just write down my impressions and a detailed review of only the first panel for now. (The others will be covered on the next couple of days). In any case – Lot’s of thanks to Barry Schwartz and the rest of the organizers as well as the generous sponsors, for giving birth to this first “sphinnconiada”. To put it in one sentence, I felt this first shpinncon was a small-but-very-friendly-rival between three groups: the SEO people, the PPC people and the SMO ones. So, what did we have there, on the first sphinncon event? The SEO panel began with an inspiring presentation plus a lecture by Branko Rihtman, an SEO specialist from Tens Technology. He talked about the importance of links in Google algorithm and the penalties by Google for buying advertisements (which are not adwords) – an old strategy known as FUD (Fear, Uncertainty, Doubt). Just to make it clear, none of the following is a direct quote. I wrote some comments while the speakers spoke and that’s it. Don’t hold no one for nothing, including myself and forgive me for the questions (or answers) I missed. – Ophir Cohen (Compucall): As far as I see it, the user experience is the most important thing, meaning your site should be popular based on what it offers to the user and not the link bating acts you did. * Is user behaviour on search engines and outside them a part of the SE ranking considerations? – Branko: Sure it is, at least as far as the tool bar most of us use. That’s why I turn mine off when I do some stuff I don’t want to be tracked by Google or any other search engine. – Gilad Sasson (Nekuda + Algoholic): Even if search engines won’t admit it, everything is being measured and saved and it obviously influences both the user and the sites he visits. * What about getting links manually vs. automatically? Is there a better option? – Sam: In order to be popular you should act like one in any measure, meaning you need to dress up accordingly, have a nice car etc. In search terminology that means you should have lots of links, almost everywhere – just keep them far from spam. – Gilad: If it is a new site we’re talking about, it is all a matter of risk. If your site is old and has enough quality links from authority sites, a couple, even tens, of louzy links won’t hurt you. – Branko: This is why I said earlier that links have two values – the fresh value and the real value. A link from a not competitive area can boost the ranking of the site but in time we’ll see a drop down, while good quality links bring on a stable increase in ranking (take a post on sphinn for example). * How do you handle the universal search results? – Sam: I don’t mind not being in the first positions as long as my title and description are catchy and creative enough to attract the searcher (using numbers and symbols on title, for example). – Barry: It is easy to get to the first position as long as you keep researching (see “iPhone Popcorn Trick” video on YouTube by Barry). * What can you say about multi-lingual search optimization? 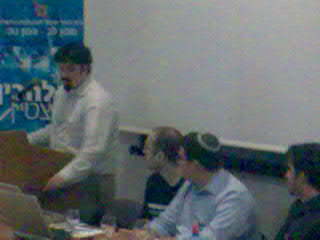 – Gilad: All markets are alike in terms of algorithms, it’s just easier on some (like Israel). In any case, if you want to promote your product in different markets you should find relevant content partners on these markets. Google Sets, by the way, is a keyword tool that can help you spam find related pages and industries to be linked from. – Branko: Advertising on the content network can help you to get ahead with terms that google think are best for your industry. If google gives them to you, according to your keyword of course, no doubt it perceives them as legitimate and relevant. * What should you do when important keyword you had a great SERP position for is vanished from top results? – Branko: First thing – wait. Just wait. It could be nothing but a glitch… while waiting you can check your positions in other data centers, other keywords and so on. If nothing changes over time – get a new domain and start all over again. From my experience it’s the best thing to do. 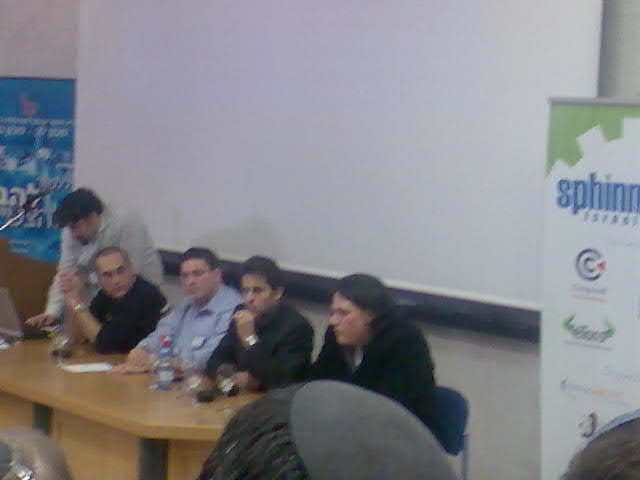 Barry Schwartz, Branko Rihtman, Sam Michelson, Ophir Cohen and Gilad Sasson (from left to right) on the SEO pannel. SMO.co.il – For Hebrew readers only (1st panel + 2nd panel, 3rd and summary). Event summary by Ophir Cohen. This entry was posted on Tuesday, February 5th, 2008 at 10:47 pm and is filed under SEM, SEO, SMO. You can follow any responses to this entry through the RSS 2.0 feed. You can leave a response, or trackback from your own site. Why did you place a link for smo.co.il they don’t believe in SEO? Nice to hear from you; thanks for the link. Thanks for the complement/honorific. I think it’s the first time someone has referred to me as “sweet” online; hopefully it won’t be the last. Hope you enjoyed the show and look forward to seeing you at the next one. Tuppy Glossop – My pleasure. Very useful information about SEO, Thanks a lot! Thanks for one’s marvelous posting! I definitely enjoyed reading it, you are a great author.I will remember to bookmark your blog and will come back later in life. I want to encourage you to ultimately continue your great job, have a nice morning!